Scott Carey (Grant Williams) is an ordinary man living a good life with his wife Louisa (Randy Stuart). One day aboard his brother’s boat Scott is the only one on deck when they pass through a glittering radioactive mist. Six months later, Scott begins to shrink, which he finds both unusual and more than a little irritating. This film was nominated for me to watch by Nolahn of Your Face! and, as with any film I’d expect Nolahn to nominate, it’s absurd. I’m shocked that a film with the premise of a man growing increasingly smaller and smaller after encountering a cloud of radioactive something-or-other made it onto the List, but I’m so very glad it did. I haven’t seen too many classic 1950s science fiction B-movies, but clearly I need to track some more down because I had a lot of fun with this film. Yes it’s often silly, the special effects leave a lot to be desired and the scale of the objects Scott interacts with varies wildly, but I was enthralled throughout. I was never scared mind you, but I was intrigued as to how the heck this film was going to end itself. It all starts out as a medical oddity, with Scott noticing that his clothes seem to be a bit larger, the doorknob is in the wrong place and Louisa no longer has to stretch to be able to kiss him. When it is discovered that he is shrinking, the race to find some method of stopping the shrinking begins, with Scott’s main aim being, of course, that one day he’ll return to his original size of six-foot-one. However, as he becomes ever smaller, eventually living in a doll house, it soon becomes clear that Scott’s primary objective should be less about undoing the process, and more about all-out survival when he becomes trapped in his own cellar, now small enough to live in a match box. They say the best science fiction has parallels to the world around us, with messages that help us to live our lives. 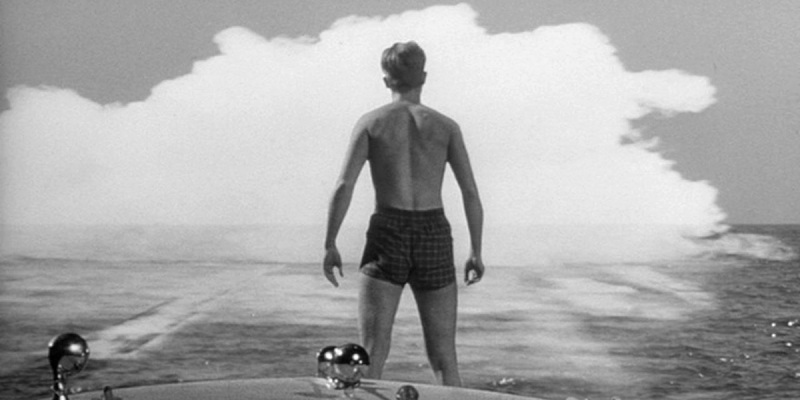 I think The Incredible Shrinking Man’s message regards masculinity, and what it means to be a man. Scott gradually loses everything he held dear to himself and his manliness. He first becomes the same height as his wife – men have always been on average taller than women. He loses his job and the respect society had given to him; they now see him as a freak-of-the-week, someone to be ridiculed or pitied. And most of all, he loses the ability to be the master of his surroundings. He is knocked several rungs down the pecking order, with the beings he once towered over and controlled now chasing him around and being a threat to his very existence. Late in the film, when Scott has to deal with his nemesis, a giant spider that was very reminiscent of Lord of the Rings‘ Shelob, Scott only feels like a man once he finds some weapons he has made from some sewing pins and thread. By then he has given up all aims other than trying to reclaim any ounce of dominance over literally anything. If he can defeat his current situation, that’s all the success he will need. I don’t know what it is about films that feature people being shrunk down, but I always seem to enjoy them. I think it’s the way they always make giant versions of the sets and props. Whether it’s this, The Borrowers or Honey I Shrunk the Kids, I’ll gladly watch any of them. Maybe it’s the use of an alternative perspective on things, setting the camera really low and looking up at the world gives a whole new slant to things. What used to be a small crate is now a cliff face that must be scaled for food. Crumbs are boulders and a pencil can be used as a floatation device. My only real issue was the very end. I had a feeling there might be some odd way of bringing it all to a close, as there didn’t seem to be any way of ending the story on a satisfactory note. I didn’t think the chosen ending which, like most of the film’s emotions, was delivered via Scott’s narration, worked very well, and it didn’t make a lot of sense to me either. Like I said though, there wasn’t really any way this could have gone that I’d have fully approved of, so however they closed it out I’d still probably have complained about it. This entry was posted in 07/10, 1001, Choose Film, Nominated List, Review, The List and tagged April Kent, Grant Williams, Jack Arnold, Paul Langton, Randy Stuart, The Incredible Shrinking Man by jaycluitt. Bookmark the permalink.